The McKesson Stainless Steel Blade Pill Cutter is a pill cutter with a durable, strong, and fully supported stainless steel blade for a precise cut when splitting pills in half. The pill cutter also doubles as a storage container when needed. You can travel with the compact cutter, store your pills until you need the medication, then use the cutter to properly split the pill depending on the dosage you need. The McKesson Pill Cutter with Safety Steel Blade and Storage is equipped with a safety release button for the single blade, the use of this feature to prevent the users from accidentally cutting themselves when reaching for their pills. The safety release button will keep the blade safe of damage from the pills when not in use; keeping it sharp for longer. 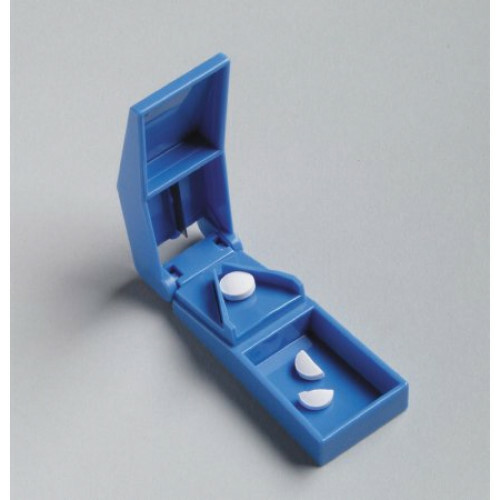 The McKesson 63-6341 Plastic Pill Cutter offers a clean cut with precision and accuracy. This clean-cut-method reduces accidental pill crushing or those that break the pill into even smaller fragments, a clean-cut pill allows the user to properly consume the right dosage.